2 confirmed cases of rabbits dying from RHD in Gillingham, Kent. Both rabbits were vaccinated against RHD 1 but the vets messed up their RHD2 vaccinations. The lab didn't test for the strain of RHD that Spencer had, and despite initially offering to pay for further tests to determine the strain Vets4Pets have decided that they are no longer willing to test for this. However, many vets believe that if we 'herd' vaccinate we can apply some sort of control to the spread. Vaccination is the ONLY hope of survival, so folks please don't be put off by rabbits who pass away even though vaccinated. You both have had enough heartache. Sadly this is true. I had already closed the rescue to new admissions a while back because of family circumstances but was still continuing to rehome those bunnies already here who are not sanctuary bunnies. All of the 60+ bunnies here (with the exception of two very poorly rabbits who we felt should not be done at this time) are vaccinated. I have RHD2 vaccinated all rabbits since the Filavac vaccine arrived in the UK 4 years ago. I will now be undergoing a revaccination of all bunnies due more than 4-6 months ahead. And all bonding has been cancelled. I have copied below what you put on the rescue page as not all members here are on Facebook. Please let me know if this isn't acceptable and I shall delete it. First I would like to thank all of you who have commented or sent private messages offering. condolences on the recent bunny losses and also for supportive messages when I announced officially that I was closing my doors. When I posted to convey the news, I mentioned that I had lost a dear bunny and it had been the straw that broke the camel’s back. The bunny that passed away was dearest Sprout, the amazing wee blue mini lop boy who had been bonded to a client’s bunny only a week before. I had been cleaning out all day, watching all of the bunnies and came in for supper. Went back to put the bunnies to bed and found him in his forever sleep. No rhyme, no reason and certainly no symptoms of anything untoward or any change in behaviour. Sprout was fully vaccinated and so was is his widow. I took him to the vets first thing the next day to discuss possibly obvious problems and we decided due to the way he went, the way I found him, the time span and because he was vaccinated and seemingly healthy, that he had possibly choked. I took him home. Following a conversation with another vet the next day (who confirmed that there had been a definite case of RHD2 at their practice of a vaccinated and apparently healthy rabbit) I did opt to do a PCR test at his recommendation. Today the worst news possible, Sprout was confirmed positive for RHD2. He had two months to go before he was due his booster. All other bunnies are fit and well (other than those who have known ailments of course) so what we make of this I am not sure. So I ask you to please be extra cautious, especially when you go to a vet practice (especially if they have had confirmed cases) because it may be that even our vaccinated bunnies are at some amount of risk now. Wear different shoes, change your clothes, be thoughtful about where you put your pet carrier as the floor will have been walked on by so many dog walkers, cat owners and those who have lost rabbits unexpectedly. Sad times for every bunny owner when vaccination is no longer enough. No vaccination is perfect of course, I understand that, but I have to ask why him, why now and why not the other 60+ vaccinated bunnies here in my care. And I will be taking extra steps to ensure that all bunnies here are as safe as they can be by increasing infection control. "Confirmed RHD2 death on 20th October (full PM including PCR test) of 16-week old rabbit, vaccinated at 7 weeks 4 days old with Eravac. 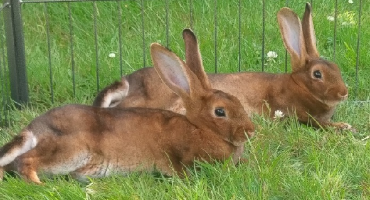 No sign whatsoever, acting completely normal at 4pm but found dead at 9pm"
Confirmed RHD2 Malvern Worcestershire "Rabbit Rescue and Friends"
They were new arrivals on site to the Rescue. Now on lockdown until March. VHD2 autopsy results confirmed. (We sadly lost two new arrivals on site to vhd2).... This is without doubt any rescues worst nightmare, and it’s now become our reality. what does this mean for the rescue? It means temporary closure! Sadly we will be unable to take in any rabbits or adopt any out until the beginning of March. This of course means no on site visits from the public. This is a precautionary measure to ensure the virus isn’t spread. Myself and my small dedicated voluntary team will carry on working hard to ensure all day to day needs are met for our beautiful bunnies, and ensure they are kept happy and mentally stimulated while they patiently wait for our lock down to be lifted and can all find the loving homes they so desperately deserve. We won’t be able to take any reservations until the end February but we will be sure to keep our Facebook page spammed with updates on our furry residents. Without the regular adoption donations we are going to have to work extra hard to find new ways to raise the funds needed to keep the rescue ticking over and We welcome any suggestions from you guys. We will soon be arranging sponsorships for our current residents. This will be £8 a month and you will receive monthly email updates on your sponsored bunny. We will also be doing our best to attend as many craft sales/open days/ Christmas markets as we can, and we are always grateful for donations of sellable items. On a personal note, I would just like to thank each and every person who has supported the rescue so far, and I hope your support may continue through the next 4 months and there after. I wish I had the time to thank you all individually and explain just how much of a difference your help makes. I could not do this single handedly, running this rescue is such a team effort ❤️ and I’m honoured to be a part of it. Please keep all our dear bunnies in your thoughts. My two are booked to have their Filavac on Monday at my vets. Tethra is a couple of weeks early and Tui about 3 months. I'm quite concerned about taking them to the vets!